It really is the New York of Asia - another city that never sleeps. Skyscrapers, hundreds of taxis, swarms of people moving from home to work, then back again. Always on the go. I love the energy, the movement, the lights and sounds. You have to love a city that puts on extravagant nightly light shows from the top of the triple towers, Marina Bay and along the waterfront – and also in the Super Tree forest in the Gardens the Bay. Vegas-esk without the hangover (or with depending). Our morning started with a choice of where to have breakfast; room service or one of seven restaurants. We thought we’d check out the options on level 57. One restaurant was for certain guests only – the ones that paid for the super expensive rooms. Another wasn’t even open yet. And the last looked amazing with tables perched on a balcony overlooking the harbour with its parade of tankers and shipping vessels. The waiter showed us to our table and poured coffee and juice before handing us a menu. Gourmet breakfast dishes were listed, almost all to do with eggs cooked in various interesting ways. The waiter asked us for our choices, but there was nothing for me. Luckily, the entire buffet was also included. As we ate, J and I only speculated how much this breakfast would be. Until we left and received the bill, we guessed it would be a $100 breakfast – each!. As it turned out, it was only $85, plus tax, plus service charge. Oh well. We were given what I could only guess was a $200-$300 per night upgrade to that magnificent suite. It was worth it. As we had been to Singapore a few times, was decided to spend the first part of the day exploring Gardens by the Bay. It was right at the doorstep of the hotel after all. Stocked up with water and armed with umbrella (my new best friend to combat the baking hot sun in Asia), we headed out along the Dragonfly river and into the heritage gardens. These were a series of sub-gardens – Chinese, Indian, Malay, Colonial, as well as fruits, palms, trees and understory. In a cleared area of lawn, the seven ton bronze sculpture “Planet” contrasted the lush displays. 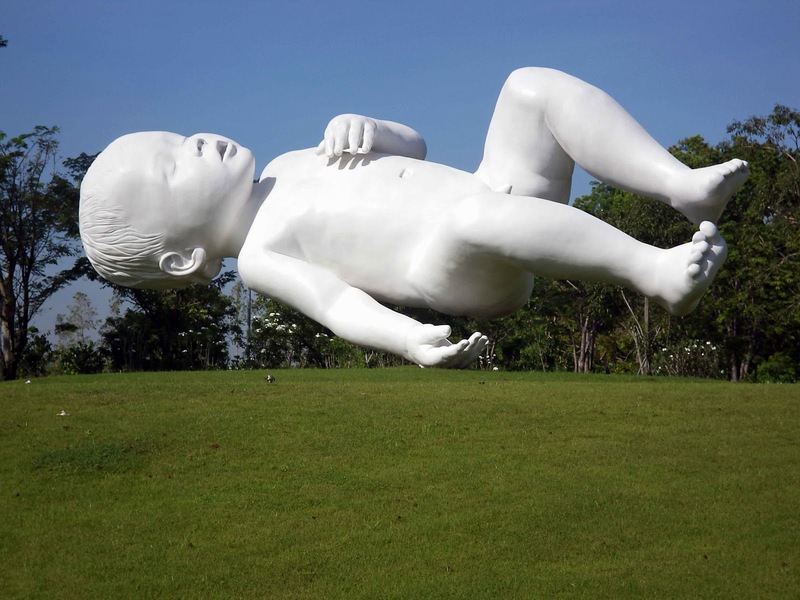 It’s a colossal white infant balancing on one hand – quite remarkable really. The Discovery section was very interesting, with mirrors arranged in a circle telling the story of the evolution of plants, and windows framing sections of garden corresponding to the various pre-historic eras. 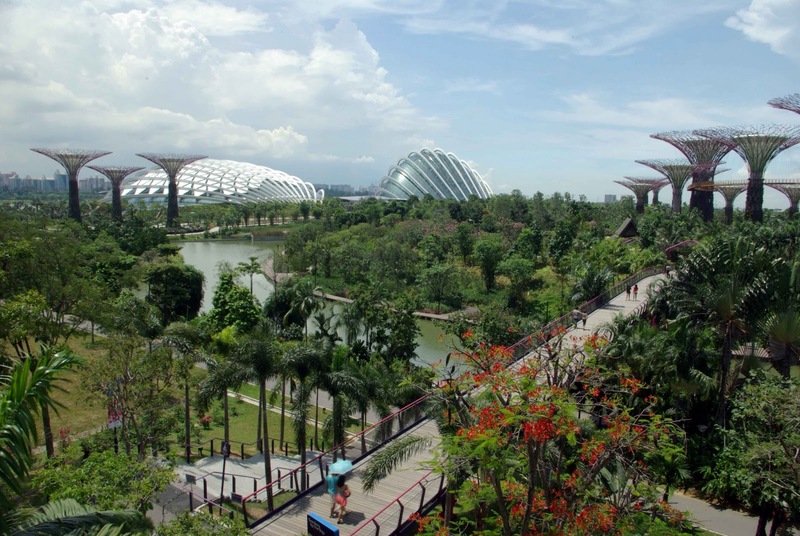 In the Supertree Grove, we paid the $5 each to walk the OCBA Skyway – a suspension bridge-like structure spanning two of the artificial, super-trees, 22 metres up, commanding beautiful views over the entire garden. Each supertree housed its own vertical garden containing bromeliads, orchids and ferns all growing up each tree’s trunk. Truly wonderful. By now we both had dark circles of sweat under our armpits and were ready for somewhere cooler. The gardens also include two glass domes. 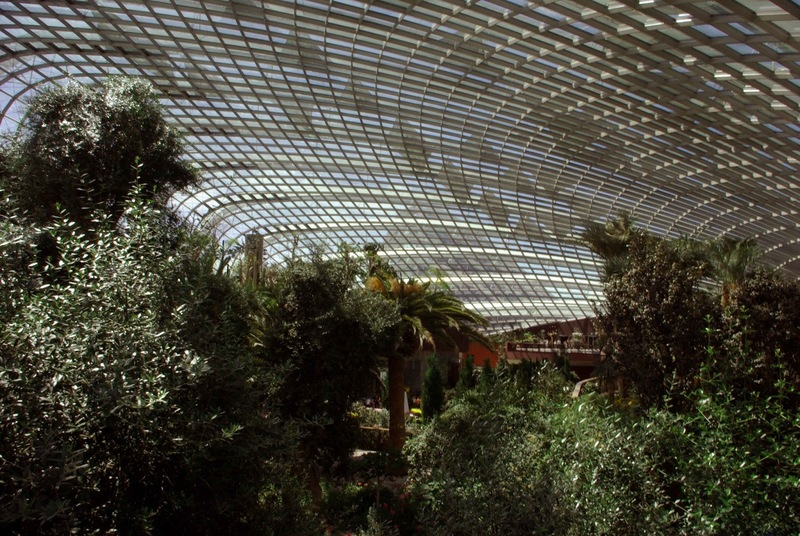 Like bio-spheres, each houses different enclosed gardens: the Flower Dome and the Cloud Forest. We happened to be visiting when the flower dome had a tulip exhibition. Clogs, windmills, and hundreds of colourful tulips greeted us as we walked through the entrance. Many locals were posing in front of the multi-coloured blooms taking photos of family and loved ones. Though it was named the Flower Dome, it housed an extensive collection of succulents and cactus, including balboa trees from both Australia and Africa. One of the most impressive views looks out over the displays in conjunction with the symmetrical steel supports of the dome’s superstructure making for interesting angles and patterns. The Cloud Forest had an equally interesting structure but instead of a spread out garden, it housed a artificial small mountain with a vertical garden growing bromeliads, orchids, ferns and palms around it’s sides. 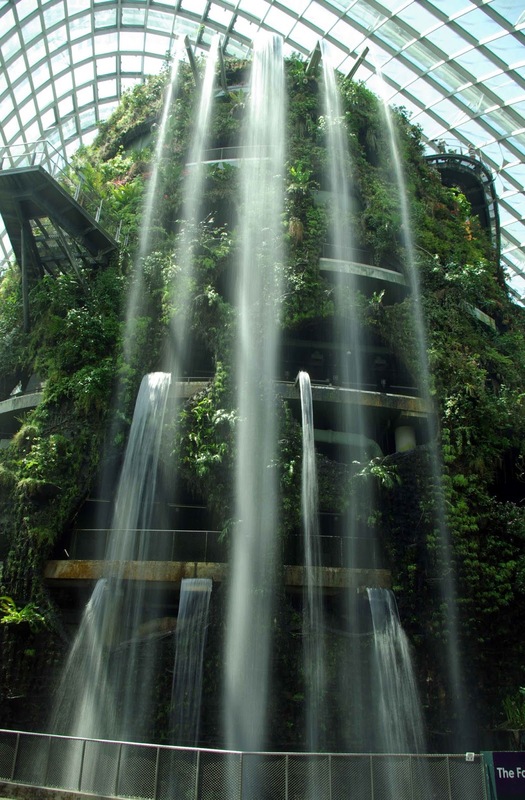 At the main entrance, a 10 metre waterfall sprays visitors as you acclimatise to the cool temperature. A lift takes you to level 6 and the top of the waterfall where you make you way down various walkways, through various climate zones representing the differences found in mountain ranges. The plants at each level corresponded to the climate zone, with beautiful orchids and palms. Other displays showed limestone formations and crystals, and a powerful video about global warming shown at the ground level as you exited reminded you of how fragile this planet really is. By the time we left, I was genuinely cold and revelled in the Singapore heat outside. Time for lunch. We returned to the Marina Bay walking back through the gardens, across a bridge over the dragonfly lake and gorgeous plants and dragonfly sculptures to the towering hotel. A quick trip to the suite to rinse the face and we decided to wander through the mega mall connected to the complex to find something there. It took a while to find our way to the food court area – with an in-line skating rink – but we found our way there by following the tempting smells. You name it, they had it, well in so far as Asian cuisines go, plus a burger joint. It took us 20 minutes to walk around the all the food stalls, each with an Asian speciality (but very few obvious veggie options). Through lake of adventure and laziness, we chose the burger joint for no other reason than it was relatively cheap and had multiple veggie burgers to choose from, plus a large assortment of meat ones too. Plus, with the next 3 weeks to be spent in Myanmar, where we were not expecting to eat much western food, we thought we should have our last western fast food fix before we left. And it wasn’t too bad. From there, we had many laughs and fun traipsing through the stores, finding some unique wears at a gadget store, as well as many crazy fashions, not to mention hugely expensive accessories. 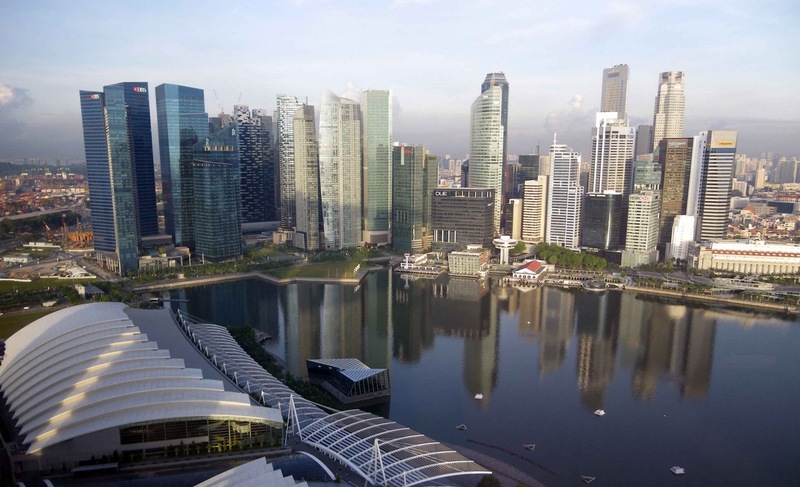 Singapore is no longer a shopping paradise unless you have a lot of money. We enjoyed going through the Louis Vuitton store for the mini gallery of pieces plus the novelty of emerging outside on Singapore bay. Discovering dark skies and a big downpour imminent when we walked back to the mall, we decided to spent the remainder of the afternoon at the Art and Science museum nearby. 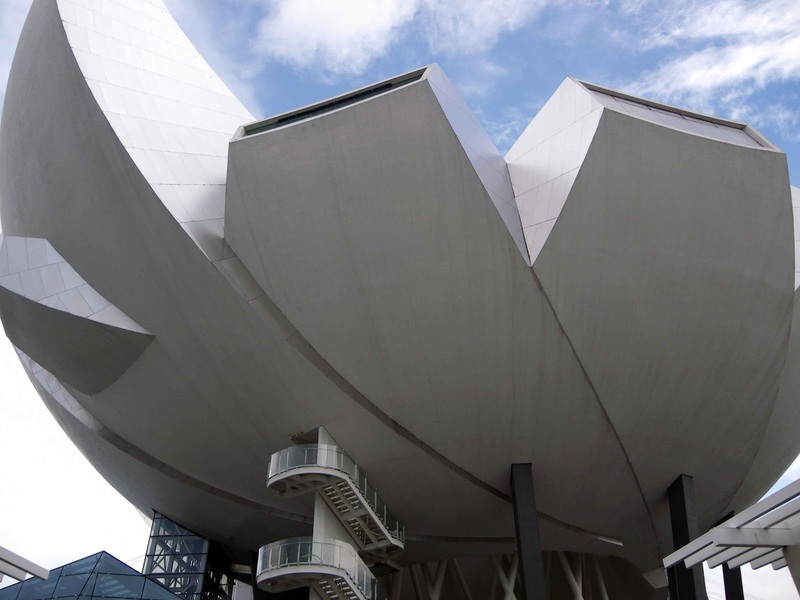 Its that quirky white lotus like structure you can see from many places on Singapore bay. Surprising large inside, we lucked in with a Mummy exhibition and a Lego display. We saw the Tutankhamen exhibition when it came to Melbourne, which was excellent, but the Mummy exhibition was equally good. There were many artefacts from Egyptian tombs, and the display was built around the story of a priest who’s mummy had been discovered relatively intact. Not only was the mummy and case one display, but there were four other mummies as well as a mummified cat. When we emerged we were surprised at how long we had spent inside. 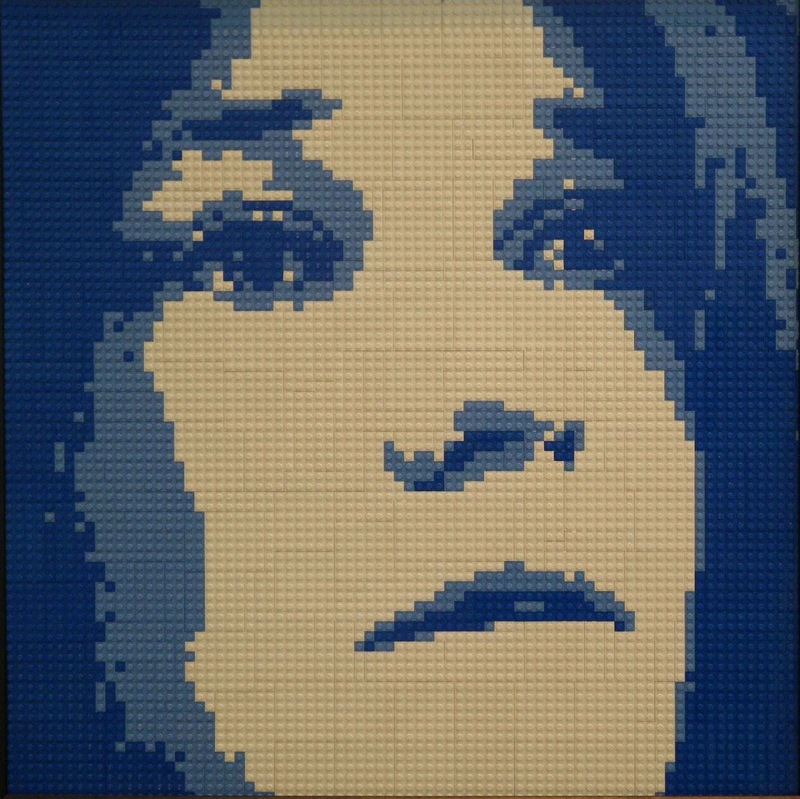 The Lego display was also wonderful in a totally different way. 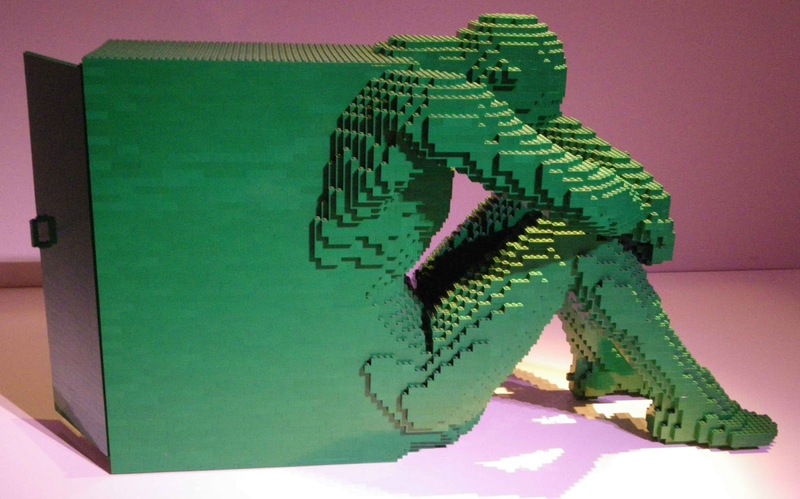 Many colourful Lego sculptures of people, pictures and objects kept us amazed as we walked through. 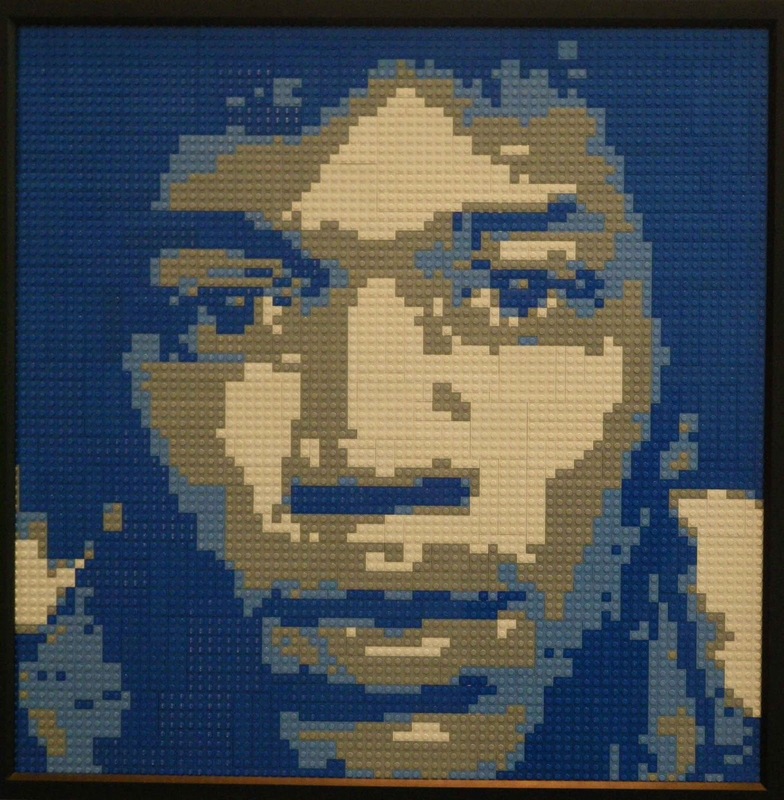 My favourites were the Lego portraits of some famous people, including Janis Joplin, Jimi Hendrix, and Bob Dylan. The other displays were also interesting. I just loved the architecture of the building and how much floor space it provided. From outside you wouldn’t think there was that much space. Our day almost at an end, we had a fast Thai meal for dinner before heading back to the hotel for some beers and another dip in the pool at that magnificent sky deck. . 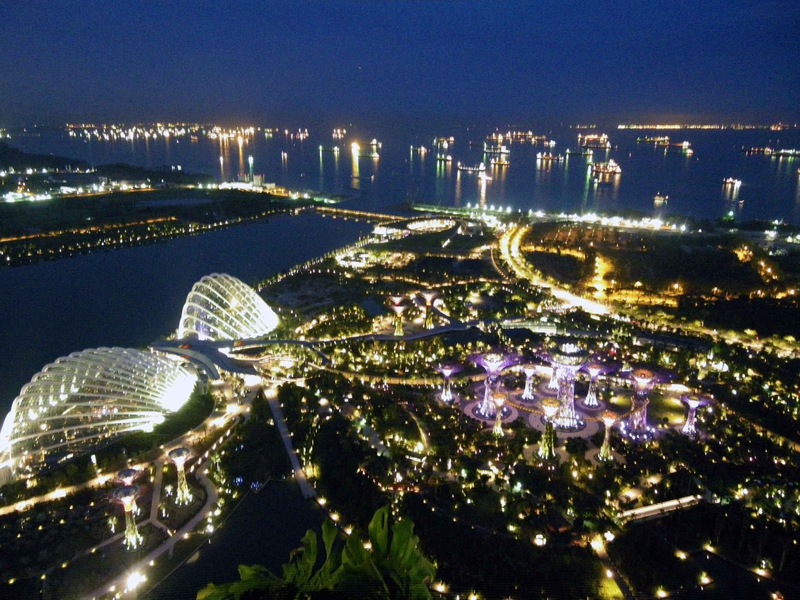 Looking out over the spectacular city view, the nightly light and sound display lit up the sky. We mused about how much we loved Singapore. I knew I’d be back – not just to the airport. We had many sights in the small nation yet to visit so we bid an early, “Good night” to the city. The following day, we had an early flight to Yangon.